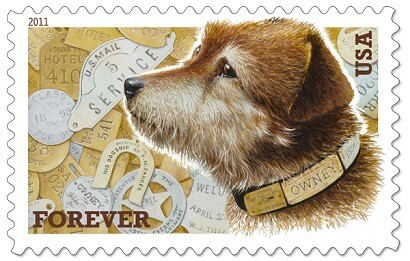 The Pithy Tale of Owney, the Post Office Pup. 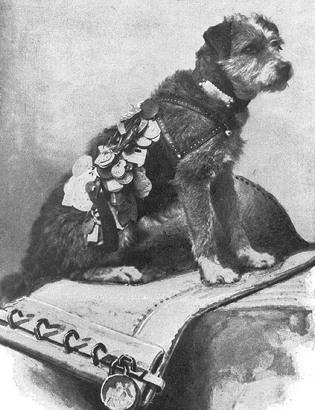 Owney was a muttly terrier who rose from the ranks of the homeless to celebrity status with his image on the newly issued U.S. Forever postage stamp. His life was that of a courageous 19th-Century pioneer pup, fighting the odds, if not the Indians. Although his life story has periods of unknown activity, as befits an independent type like Owney, it is sometimes necessary to fill in the blanks with an imagined version of probable events. Here then is a mostly true tale of as brave a being as ever worked in a branch of the government explicitly authorized by the United States Constitution. Owney was born in Albany, New York. Probably. One can never tell with a one-night stand. He may have been born in 1886, 1887 or 1888, more or less. You see, births were not registered back then unless you were human. 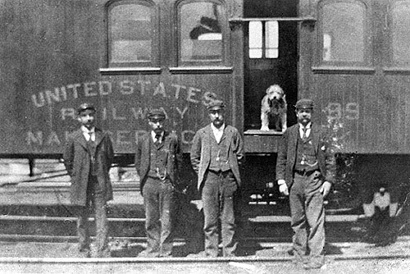 Owney badly wanted to be human and even more, he wanted to be a mailman in the RMS (Railway Mail Service). Some say Owney began his career walking to work with a human postal clerk who took a shine to him and let him hang out at the work place. Others believe Owney simply crept into the post office, unnoticed, and began his career that very day, when he fell madly in love with a mail pouch. Owney developed a passionate and lasting affection for all ordinary mail pouches transported by railroad and mail wagon. One day, a sack of mail fell off the mail wagon Owney had hitched a ride on, and he jumped off the wagon and onto the sack, guarding it until the driver could retrieve it. It is fair to say that Owney idolized those bags even more than the humans who dealt with the mail they contained. Perhaps, since mail sacks were used by mailmen on their routes as shields against unfriendly canines, it was the scent of all those other dogs that so fascinated Owney. Or perhaps the leather wasn't properly cured. Whatever the reason, Owney was in love and decided to stay forever. In fact, he did even better than that; he also traveled with them. It wasn't so much that Owney wanted to ride the rails, it was more that he followed the mail sacks onto mail wagons and then onto mail trains, riding along with the bags wherever they went. He was even known to leap from one mail train right onto another. There is no proof that Owney helped railroad mail personnel sort the mail while in transit, becoming the fastest sorter of all time, but neither is there proof that he didn't. Owney was a jet setter long before jets were invented. He traveled first across New York State, and then across the entire nation, and in 1895, Owney went around the world, traveling with mailbags on trains and steamships all the way to China, Japan, The Suez, Alaska, Mexico, and across Europe, before coming home to Albany. We know this is true because The National Postal Museum in the Smithsonian says so. The kind people Owney met on his many trips began to give him medals and tags with the name of their town to put on his collar. One tag reads "Presented to His Dogship by F.M. Parker." In 1894, a reporter for the Brooklyn Daily Eagle wrote that "Nearly every place he stopped, Owney received an additional tag, until now he wears a big bunch. When he jogs along, they jingle like the bells on a junk wagon. "�In fact, he had so many that when Postmaster General John Wanamaker heard that the weight on Owney's collar was getting awfully heavy, he gave Owney a special harness to lighten his load. And take him along with ye. Knowing that Owney lived an exciting and useful life makes it somewhat less depressing to learn that he did not die of old age. Alas, after debarking a mail train in Toledo, Ohio in June 1897, and under shady circumstances at best, he died of a bullet wound. Perhaps it was an accident by Ohio�s crack shot, Annie Oakley, when she was cleaning her rifle, or revenge by someone who mistook Owney for his faithless wife, or a thief who tried to steal a mailbag guarded by Owney. He died as he lived, brave and strong, representing the U.S. Post Office. But even deceased, Owney still traveled. 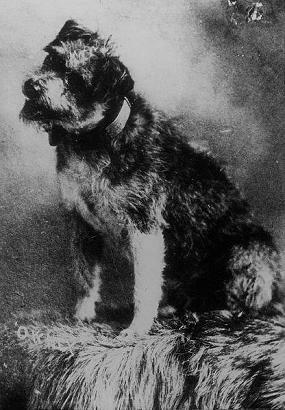 Owney is right up there with Lassie, Old Yeller and Benjie with many books written about him: "Owney The Post Office Dog and Other Great Dog Stories," by Joe L. Wheeler; "The Further Adventures of a Lucky Dog: Owney, U.S. Rail Mail Mascot," by Dirk Wales; "Owney the Mail Pouch Pooch," by Mona Kerby; "A Small Dog's Big Life: Around the World With Owney," by Irene Kelly; and "All Aboard, Owney! The Adirondack Mail Dog," by Jennifer Gordon Sattler. Even though Owney himself may be no longer technically alive, his spirit lives in the hearts of all who know of his dedication and abiding love.